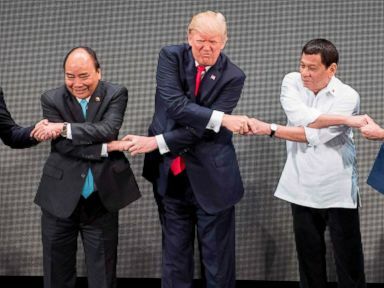 As President Donald Trump returned home Tuesday after a five-nation, 13-day tour of Asia, the region took stock of the lasting effects he left behind. Here's how the tenuous relationship of the three most powerful countries Trump visited -- South Korea, China and Japan -- could play out after his visit. South Korean President Moon Jae-In shakes hands with President Donald Trump during their summit at the presidential Blue House, Nov. 7, 2017 in Seoul, South Korea. Many South Koreans breathed a collective sigh of relief after Trump wrapped up a two-day visit to Seoul before leaving for Beijing last week. The president's previous tweets and comments about North Korea, including saying any threats would be met with “fire and fury” and nicknaming Kim Jong Un “little rocket man,” had many worried he might again unnecessarily humiliate the North Korean regime during his visit and escalate already heightened tensions on the Korean peninsula. Some South Korean officials were also wary of Trump's relationship with Japanese Prime Minister Shinzo Abe, given the historic animosity over Japanese colonization from 1910 to 1945. With Trump in office, local reports and columns were filled with predictions and concerns that the U.S. was no longer South Korea's strongest ally and thus Seoul should focus more on building relations with China. Perhaps North Korea's almost two-month-long silence without any missile or nuclear tests had some effect on Trump, but the two-day visit went by surprisingly smoothly. There were anti-Trump protests throughout the city, but first lady Melania Trump's fashion and her unusual burst into laughter together with top K-pop star Min-ho of SHINee, got much more attention by the local press. Trump's speech to the South Korean National Assembly on Wednesday was also well-received. "He showed off potential to be a worldly statesman from a rookie politician shouting America-first," a columnist wrote on Chosen Ilbo, one of South Korea's largest newspapers, noting that Trump mentioned Kim Jong Un by name only once. 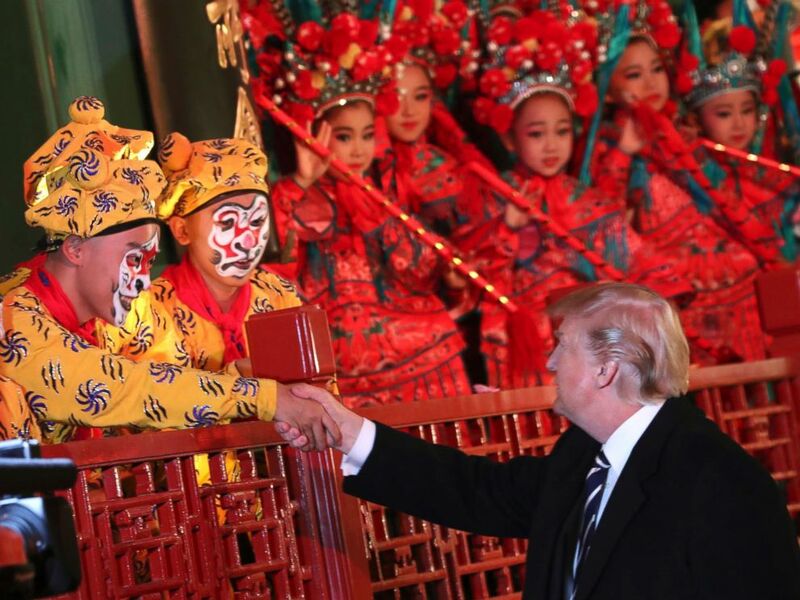 President Donald Trump shakes hands with an opera performer during a tour of an opera performance at the Forbidden City, Nov. 8, 2017, in Beijing, China. During his “state visit plus” to Beijing, Trump did not see much of China -- or Beijing itself for that matter. But he did see a lot of President Xi Jinping. This was obviously by design by the handlers of both leaders. 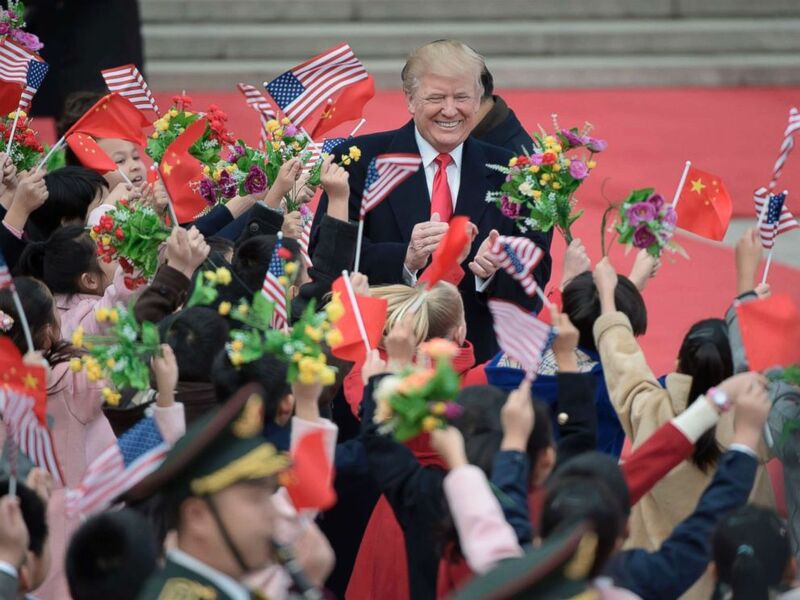 For Americans, here was Trump, who railed against China throughout his campaign, getting a massive red carpet treatment -- a seeming sign of respect for the 45th president that was lacking when the Chinese literally forgot to roll out the stairs for President Barack Obama on his final trip to China last year. Pageantry and flattery comes naturally for the Chinese, and being a gracious host is a sign of strength. For the Chinese audience, here was their newly empowered leader receiving the leader of the other superpower in the world. Xi has sought a relationship of equal standing with the United States since he came into power in 2012. The symbolism was obviously not lost on Xi, a keen student of history, that he received Trump inside the Forbidden City -- the former Imperial Palace where two dynasties of Chinese emperors received dignitaries from visiting tributary states who wanted something from China. In fact, one of the videos that went viral in China shows Xi giving Trump an impromptu history lesson on the grounds of the Forbidden City. Trump is heard mentioning that ancient Egyptian civilization is older than Chinese civilization. To which Xi promptly points out that although ancient Egypt is older, Chinese civilization has been continuous for 5,000 years. In return for Trump’s "tribute," China gave him something to tweet about: $250 billion in trade deals for American businesses. Many of them, however, are non-binding. As some of the deals were being signed, Trump, with Xi seated next to him, told the gathered crowd that he didn’t blame China for taking advantage of the U.S., reportedly eliciting audible gasps from reporters in the room. 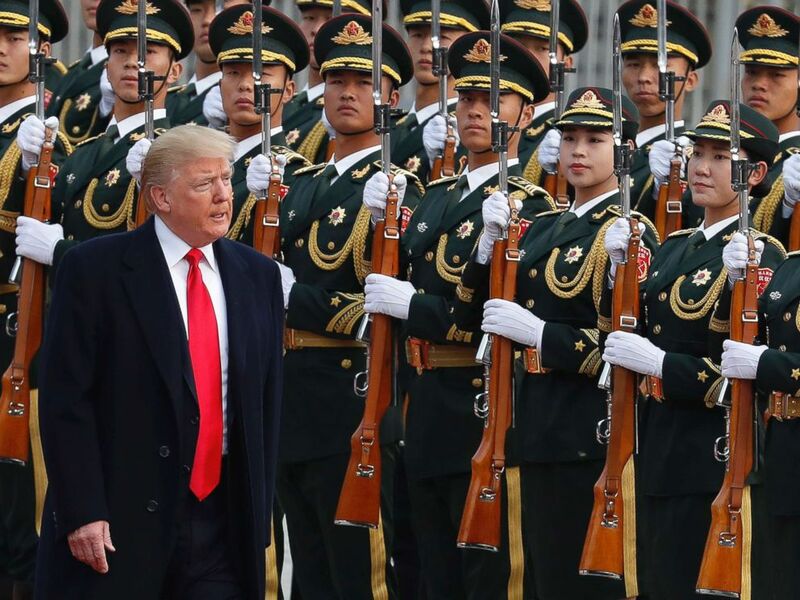 No sooner had Trump departed Beijing for Vietnam than Chinese state media returned to its default setting, focusing on Xi’s own trip to the Asia-Pacific Economic Cooperation (APEC) summit and southeast Asia. President Donald Trump reviews an honor guard during a welcome ceremony at the Great Hall of the people in Beijing, Nov. 9, 2017. If South Koreans watched Trump’s Japanese reception in distaste mixed with jealousy, his stay in China was met with careful analysis and evaluation. South Korean President Moon Jae-in has stressed the importance of "balanced diplomacy" repeatedly where the country balances between the historically powerful United States and the newly ascending China in case of a possible tipping point. 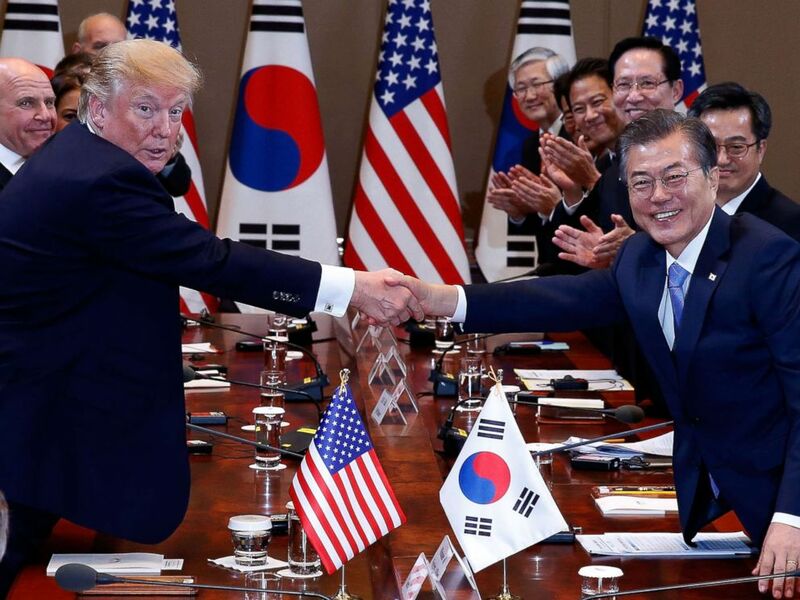 The history of the U.S.-South Korea alliance dates back several decades, but Trump’s attitude in Beijing has sparked the question of whether siding with the U.S. is really the way to go. Xi had obviously gone to great lengths to impress the U.S. president, just like South Korea and Japan. The clip of Xi hurriedly taking his hands out of his coat pockets when Trump glances at him has gone viral in South Korea with people jokingly pointing to the gesture as a sign of U.S.’s remaining dominance over China. But just as much as Xi struggled to impress Trump, the president unexpectedly warmed up to him, treating him as "an equal." President Donald Trump attend a welcome ceremony at the Great Hall of the People in Beijing on Nov. 9, 2017. This seeming equilibrium of power displayed during Trump’s visit in Beijing has left South Korea torn. On one side, China is putting pressure on South Korea for its decision to deploy anti-ballistic missile defense systems with U.S. assistance. On the other, the U.S. is asking South Korea to join the military alliance it has formed with Japan, which may further aggravate the barely patched relationship with China. The South Korean government already rejected a U.S. proposal to conduct a trilateral military exercise with Japan last weekend. With another summit talk between Moon and Xi coming up next month, the "balanced diplomacy" of South Korea is now being challenged. Despite all the pomp and circumstance, Trump left China and Asia with no solid concessions from Xi over trade practices, shipments of Chinese-produced opioids to the U.S. or even a solid commitment that China would add more pressure to North Korea -- pending Trump’s big address on Wednesday evening. Once both leaders were at the APEC forum in Da Nang, Vietnam, the Beijing bromance looked more like loveless facade, a marriage of convenience as they staked out competing corners of the international stage. While Trump brought his "America First" message of bilateral trade deals to APEC, Xi defended globalization, extolling the virtues of economic openness and multilateralism. To gauge how Trump’s message was received among the Pacific Rim nations gathered in Da Nang, less than 24 hours after his speech, 11 countries decided to move ahead with a version of the Trans Pacific Partnership (TPP) without the United States. Trump pulled out of TPP immediately after he came into office. ABC News' Yejin Jang contributed to this report.